VANCOUVER, BC, CANADA, February 4, 2019 /EINPresswire.com/ -- FOR IMMEDIATE RELEASE: Though it might be a mystery to you, British Columbia has a vibrant mystery writing community. 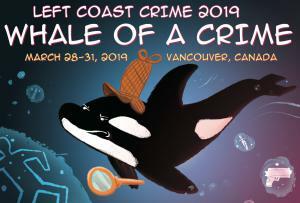 As a result, BC authors will be well represented among the attendees at Whale of a Crime, Vancouver’s presentation of Left Coast Crime1, a crime fiction conference hosted annually by a different city in Western North America. Ever wanted to write a screenplay3? Local award-winning journalist, screenwriter, playwright, and occasional performer, Mark Leihren-Young will be conducting a workshop that focuses on adapting work for the screen. Hollywood North with Mark Leihren-Young takes place on Wednesday the 27th, the day before the conference begins. Prior registration is required.